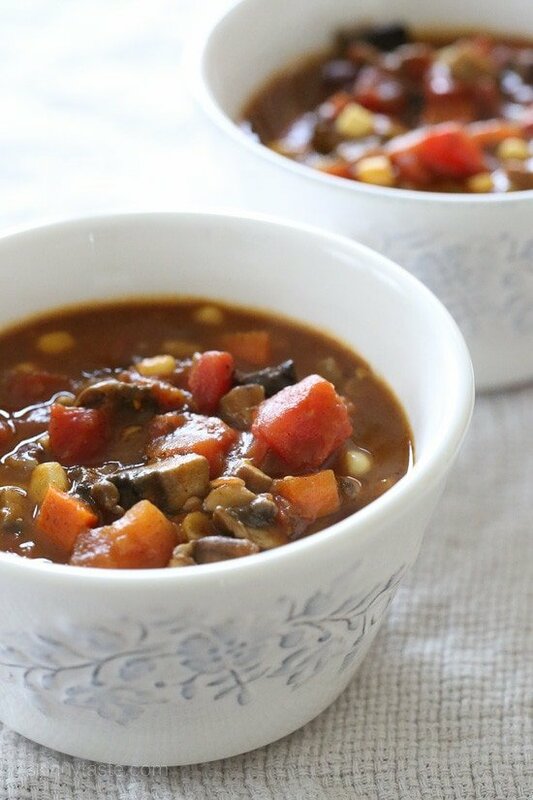 Break out your soup pot, because you’ll want to make a batch of this delicious, hearty meatless vegetarian pumpkin chili recipe today! Packed with vegetables, beans, pumpkin puree, beans and tons of flavor, then served with cheese, tortillas, avocado and all the yummy toppings. More of my favorite Fall hearty chilis are Turkey Pumpkin Chili, No Bean Turkey and Sweet Potato Chili, Buffalo Chicken and Bean Chili, Turkey Chili Taco Soup and Turkey Chili Stuffed Acorn Squash. There’s lots of spices and vegetables in here, but trust me I wouldn’t change a thing. Prep all your ingredients before you start cooking, then once you sauté all your vegetables the rest of the time it’s pretty hands off while it simmers. Leftovers freeze and reheat well, perfect for packing lunch for work. 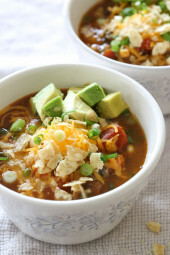 Break out your soup pot, you’ll want to make a batch of this delicious, hearty meatless vegetarian pumpkin chili today! Packed with vegetables, beans, pumpkin puree, beans and tons of flavor, then served with cheese, tortillas, avocado and all the yummy toppings. Heat the olive oil in a large heavy pot or Dutch oven over medium-high heat. Add the onion, garlic, ginger, and jalapeño and sauté until vegetables are soft, about 3-4 minutes. Add the carrots and mushrooms and cook until carrots start to brown and mushrooms release some of their liquid, stirring occasionally, about 6 minutes. Add the seasoning mix and stir to evenly coat. 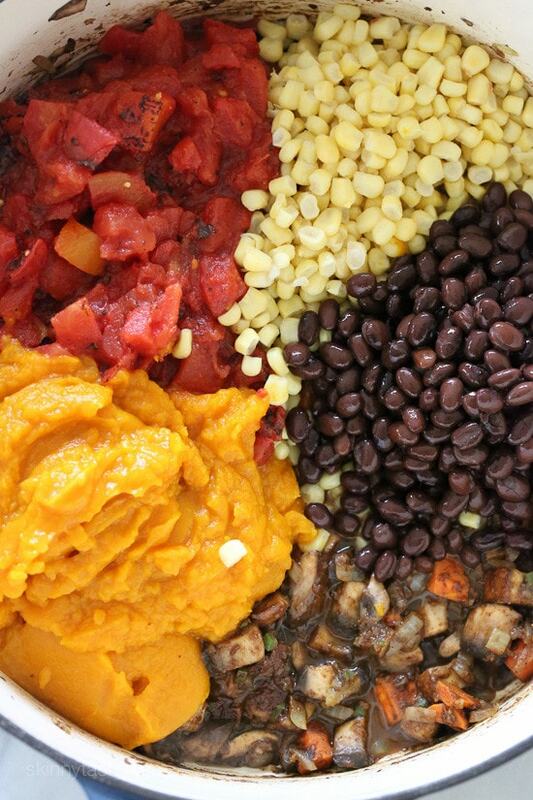 Add the corn, tomatoes, pumpkin, beans and stock and mix well. Cover, reduce heat to medium-low, and simmer for 45 to 50 minutes, stirring occasionally. *Nutrition info for toppings includes ½ a green onion, 1 ounce avocado, 1 tablespoon cheese, ½ tablespoon sour cream and 1 tablespoon crushed tortilla chips (per serving). Just made this for dinner. It was utterly fantastic. Didn’t have any cayenne so I added an extra jalapeno. Delicious. You certainly don’t miss meat. Will definately make it again. Wow! I made this recipe exactly as written and it was sooooo delicious! I wasn’t sure how it would all come together but it was amazing. Definitely will be making this again in the future. I made this for dinner tonight and my family loved it! Thank you! Made this tonight with three smaller portobellos and about a cup of diced leftover turkey from Thanksgiving, tastes great! The pumpkin makes it very thick but it’s hearty and tastes great! Oh so good! Never would have thought spicy with pumpkin sweetness and the savory toppings would go together so wonderfully! I found it a bit spicy, but my kids didn’t think so – though they had more cheese and sour cream on theirs ;)Another keeper, whole family approved. Very easy, soooo many fresh veggies, I think these recipes are protecting us from the seasonal viruses! Fantastic recipe and very adaptable! days before thanksgiving, the supermarket had no pumpkin puree so I substituted with butternut squash (in pieces). We don’t have cayenne pepper at home so we added chipotle powder. We loved every piece of it and will definitely make again!! This is delicious! I added just a little cumin because I like the extra smokiness, and used Greek yogurt instead of sour cream. My husband and I both loved it! I’m guessing the oil needs to be added to the heating/hot pot before the vegetables, in step 2 or 3? The oil isn’t addressed anywhere in the directions. Yes! Thank you, just corrected this. I kind of did crockpot today – I started it in a pan to sautee everything last night and refrigerated it overnight. Today I moved it to crockpot for 4 hrs on high. Based on the results, I’d say you could just do the whole thing in the crockpot without any change in results. This was really delicious!! Love the added thickness from the pumpkin. Thanks Gina! I made this today as it looked amazing. I have been cooking a lot of vegetarian and vegan foods since I am vegetarian and now my 1 son is as well. 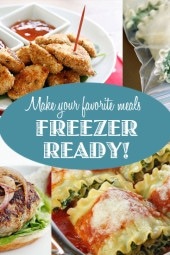 I freeze food for both my sons as they like home food, I am always looking for healthy recipes I can freeze. This turned out fantastic with just a couple of minor modifications. I used small green chilis rather than jalapenos as I did not have the jalapeno. I also added more veg broth and some quinoa. Cant wait to have for dinner tonight. I made this tonight for a ladies’ night potluck. It was a big hit! Great flavours with just enough heat. My husband loved it too. It reminded him of a traditional Greek bean dish that his mother makes. I made this in my Instant Pot. This is definitely a “do over” recipe. This soup was so delicious! I am eating a leftover bowl for lunch. It is so hearty and filling, you definitely don’t miss the meat. Great recipe! My family LOVES this recipe! Just curious how long leftovers will keep in the fridge? Thanks for the help! Would you have a salad recommendation to go with this soup? It looks wonderful! Is there an Instant Pot version? Thank you! I made this tonight in the instant pot. I sautéed all the ingredients as instructed using then put it on manual for 10 minutes. Came out great! Delicious!!! Can’t tell there is mushrooms in this!! Pressure Cooker version? Just saute veggies in pot then simmer for half the time, you think? Hi Gina, do you know what the calories are for 1 cup without the toppings? Thanks! There was an odd flavor that I couldn’t quite identify that I wasn’t a huge fan of… I’m thinking it was the fire-roasted tomatoes, since I have never used these before. Next time, I will probably use regular diced tomatoes. Other than that, I thought it was really delicious! I also added some cavatelli noodles to make it even heartier, but of course, that adds to the points value if you are following WW. Was wondering what the crockpot version would be or if it would work in the crockpot? If I wanted to add in some turkey meat, how would I go about that? At which part? Brown it first, set it aside and add it with the liquid. Wonderful!! I will definitely make this again! Love the layers of flavor and the pumpkin was a nice flavor (not overpowering). Has anyone tried this in a crock pot? Aside from the adding liquid comment below, any other suggestions? Considering making Wednesday morning on the stove and leaving in the crock pot on warm to bring to a dinner that night. Did you ever make it in a crockpot? I am new to your site and this is the second time I am following your recipe. This one is just delicious! Thank you! Hi Gina, I see this in the Freezer Friendly category. Do you recommend freezing the uncooked ingredients or the cooked chili? Thank you Gina for another awesome recipe! This chili is so tasty and I loved the spicy kick it gave. 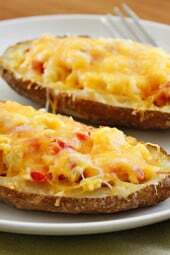 To cool the spiciness just a tad, I topped it with a teaspoon of light sour cream and a little shredded mozzarella. I also used salted vegetable stock. A perfect comfort food for a cold January day. Wow! We made this for dinner last night! It was DELICIOUS! The spices were so unexpected. It was comforting and rich, without feeling heavy. This will be a repeat in my house. Thank you, Gina! Made this tonight – wow is it delicious! The pumpkin adds richness along with the mushrooms. It was a little spicy (I like that), but if you didn't you could leave out the cayenne and maybe use half the jalapeño. There does not appear to be a saturated fat count to calculate smart points. When I put in fat, and the same # for saturated fat, it comes out to 9 SP. Is there no saturated fat??? I know this comment is super old but I thought I’d reply anyway. You can’t calculate the SP value of a recipe using the calculator because the nutritional values include all the vegetables. WW doesn’t count the points for “free” vegetables in recipes, it only looks at the foods worth points, so you have to put it in the recipe builder. I did this to see the SP value without toppings and I believe it is 2SP per cup 🙂 because the only things in the recipe with points are the beans, corn, and oil if you use any to saute your vegetables. I want to try this WITH meat and without corn…to make it paleo 🙂 I'll let you know how it comes out! Maybe I'll sub potatoes and ground turkey. Thanks Gina!! Sorry, but I made this and did not care for it….just didn't have That 'chili' taste. Just made this…didn't have black beans but used navy…..its great…..i love the texture of the pumpkin…..thanks…. This was wonderful! I have had a different version of pumpkin chili and this particular recipe is my favorite. Love it. I didn't buy enough ginger so only used one TBS but I don't think it as a problem. I made this for my work potluck and everyone loved it! 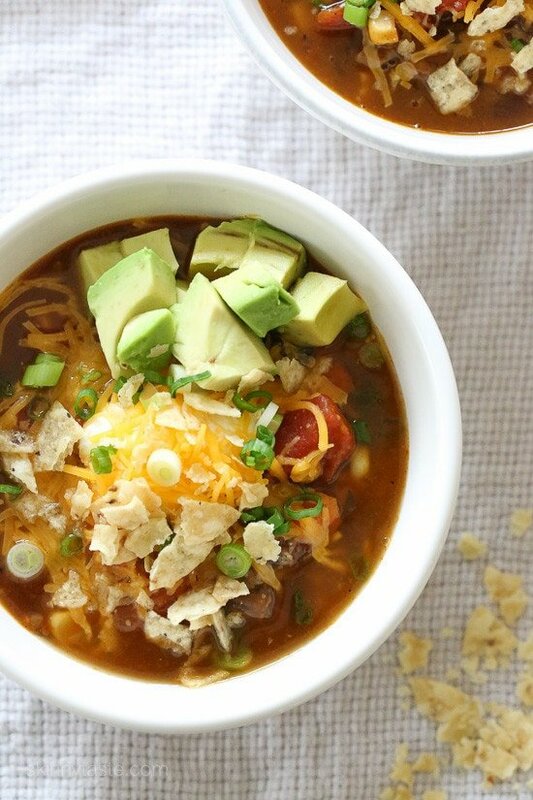 It's different from your usual chili, but in a good way. The two vegetarians who tried it were especially pleased. They said they've had a lot of veggie chili in their lives, so they were pleasantly surprised that it was a little bit different and delicious! Thank you! Looking forward to making this tonight! headed to the grocery store now! Hi Gina, I'm a big fan! Last night I made this pumpkin chili and think it's great, except that the chili powder was overpowering. Are you sure it's 1 tablespoon? We like spicy food, so it's not that it was too hot, but too strong. Maybe it was the medium-hot chili powder blend we use? (It's from a high-quality, boutique store, the Geneva Spice House.) I just want to check with you before we share your delicious recipe. Thanks! BTW, to tone down the chili powder, we steamed some sweet potato chunks and added. Seemed to really help. Next time you make it start with 1t and add to taste, glad you liked it! This was dinner tonight. I wondered about the spice mixture, but it worked beautifully. Exceptional chili. Thanks for another great recipe. We made this last night, and it was awesome! I was curious how my meat-loving husband would receive it, but he enthusiastically went for seconds and was looking forward to having it for lunch today. I didn't have fire-roasted tomatoes (just regular), but I didn't feel like it was missing the them. Had a nice kick to it, but not too much for my wimpy taste bugs. Tortilla chips on top totally made it. Will save this one! I just made this and it is marvelous! Initially, I tried the recipe exactly as stated and I thought the flavor was a little one note. I added some heat using my favorite habenero hot sauce (Torchy's Diablo sauce from Austin, TX), which added greater depth of flavor and more heat (which I thought it really needed… it is chili after all!). I thought, in general, it was underseasoned as well. So I salted and peppered to my taste. I'm looking forward to having it tomorrow night, after the flavors have melded a bit more. I think I'll squeeze a bit of lime in to add another dimension of flavor. This was amazing! Trader Joe's makes pumpkin tortilla chips which made this chili even better! My family is afraid we are going to turn orange with all the pumpkin we've been eating! Thanks for keeping meal planning fun and healthy! Hi Gina – this looks so great! I love fall because I love incorporating pumpkin into most of my meals. This looks like it'll make a great lunch to take. I see a lot of other commenters concerned about the mushrooms and thinking about adding more beans – but wouldn't that be too bean-y? If we have to skip the mushrooms, do we even need a substitute? Vegetarian AND Chili? Couldn't love this more!! Gina, I am not a fan of pumpkin. 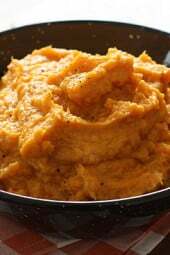 Do you think butternut squash or sweet potato puree would work in this recipe instead of the pumpkin? I used canned organic butternut squash and it works perfectly. Would love to know a good substitute for the mushrooms. Like another poster, my husband unfortunately won't touch mushrooms with a 10-foot pole. The rest of the recipe sounds great, though! I was just about to say you lost me at mushrooms. Maybe potatoes? Maybe some white beans (Navy or Great Northern)? Would eggplant work as a good substitute? I have now answered my own question. I made this today exactly as written since I didn't want to change it without at least trying it. Gina knows what she's doing! The chili is just delicious and NO it doesn't taste like pumpkin pie. It's just savory and spicy. Perfect for a cold fall day. I thought the same thing, that the spices would be too sweet. They blend right in and add to the richness. No pie taste at all. We thought the cloves overwhelmed the chili. 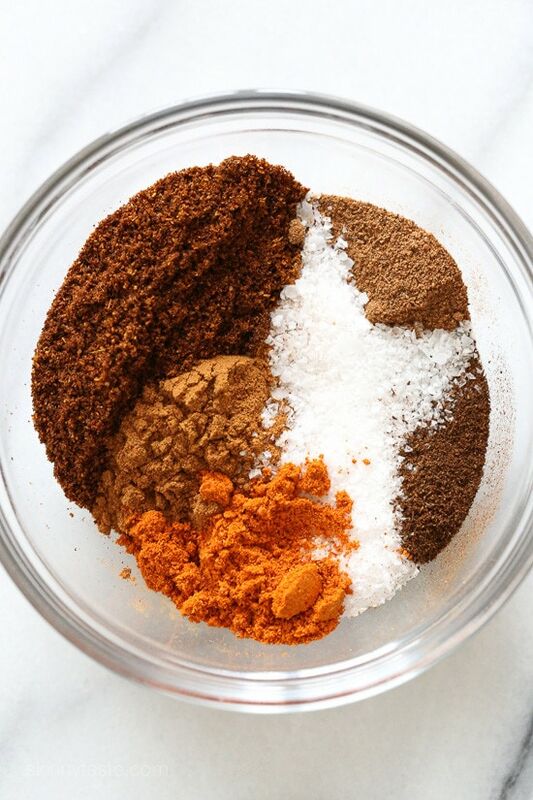 I added three more tablespoons of chili powder and a tablespoon of sugar. We sampled it before adding the toppings and I thought it might end up getting tossed out. However, the addition of the avocado, sour cream, shredded Mexican style cheese and crushed tortilla chips (I used Mission chips) made it a lovely dish! Next time I would leave out the cloves or just add a "pinch". This is not sweet at all, does not taste like pie and once you put it all together, with the toppings, trust me it works! But you can omit if you wish! Made this tonight exactly as is and added 3/4 cup quinoa and 2 extra cups of broth. Turned out really delicious! I'm sure it will be even better tomorrow! If I wanted to make this but my husband refuses to eat mushrooms in any form, what would you suggest I use to replace them? I was thinking lentils but curious if you had any recommendations. 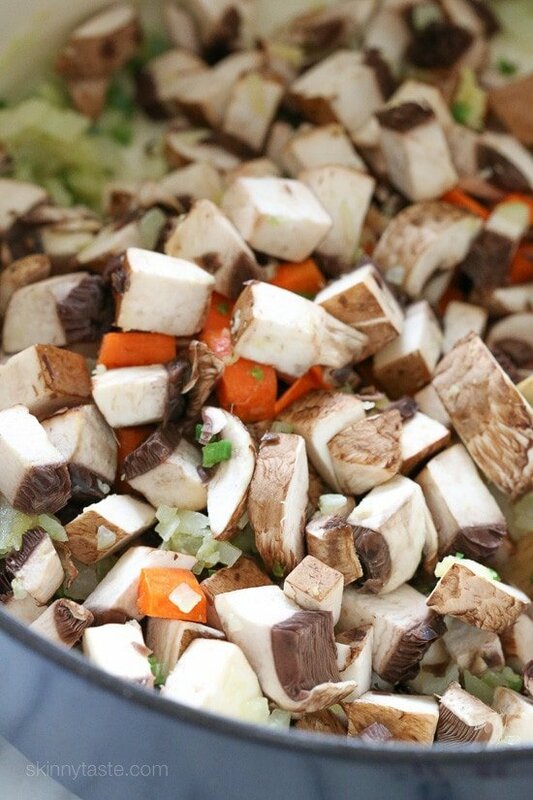 I cut the mushrooms into small pieces and they blended in with all the other ingredients. We couldn't even tell they were there. I’m highly allergic to mushrooms. I leave them out or double the onions. Looks great! Any chance you have the crockpot version? I usually just add 2-3 c. of liquid to recipes to make them in the crock pot! Sorry that feature no longer works, for now pinning it to a Pinterest board is the easiest option. Looks amazing. I know what's on my menu for next Meatless Monday! Sounds delicious! I love the sweet and spicy combo.